1st set: 10:15 Saturday Night, Accuracy, Grinding Halt, Another Day, Object, Subway Song, Foxy Lady, Meathook, So What, Fire in Cairo, It's Not You, Three Imaginary Boys, Weedy Burton. 2nd set (with Roger O'Donnell): A Reflection, Play For Today, Secrets, In Your House, Three, The Final Sound, A Forest, M, At Night, Seventeen Seconds. 3rd set (With Roger and Lol Tolhurst): The Holy Hour, Primary, Other Voices, All Cats Are Grey, The Funeral Party, Doubt, The Drowning Man, Faith. 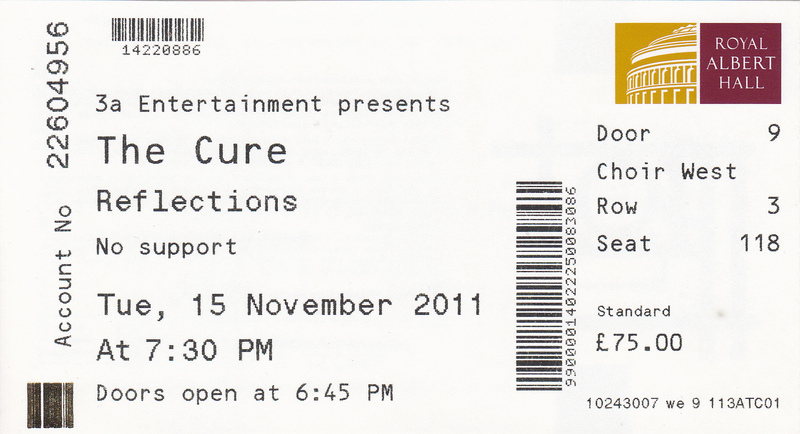 1st encore: World War, I'm Cold, Plastic Passion, Boys Don't Cry, Killing An Arab, Jumping Someone Else's Train, Another Journey By Train.